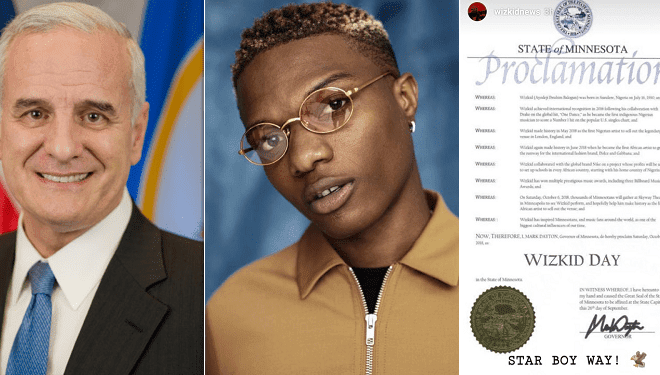 The governor of Minnesota in the US, Mark Dayton, has officially set aside October 6, as Wizkid Day, to honour Ayodeji Ibrahim Balogun, popularly known by his stage name, Wizkid. Just when you think Starboy has achieved all that he can, the Bad Energy crooner goes ahead to leave more fans in awe with proof that he is very deserving of the name Starboy. Recent reports show that the singer now has a national day in his name. According to the sealed and stamped document, October 6, of every year has been declared as Wizkid Day in the state of Minnesota, US. The document released stated the reason for this huge landmark is to honour the singer for his numerous achievements in music and for his role as a culture influence. 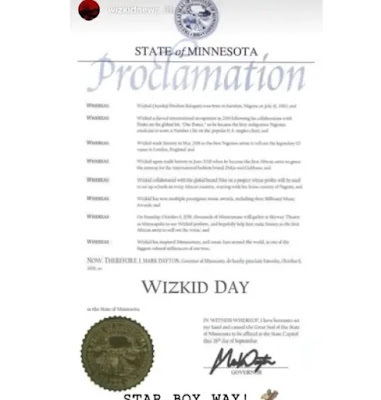 Some of his achievements, include recently becoming the first African artist to sell out the Skyway Theatre Minneapolis, making a Billboard number one hit ‘One Dance’ with Drake, selling out the O2 Arena London, walking the runway with Dolce and Gabbana, winning international awards, and many more.